At sixty years old, nobody expects you to be particularly tech savvy; that’s why an old timer with a firm grasp on the most cutting edge technology is so impressive. It takes a long time and a lot of trial and error to pick up modern technology after a long life without it – and for the 2016 Chevy Malibu, now approaching its sixth decade as a model line, few things manage to impress us as much as its incredible tech features. Whether you’re looking for premium entertainment, ultimate safety, or a good way to stay connected on the road, the time-honored Impala is there to offer exactly what you’ve been looking for. And for a vehicle that’s older than some of its competitors’ entire lineup, this is no easy feat – simply a testament to the innovation and forward-thinking design found in many of this year’s newest Chevy models. Here’s a quick look at some of the most impressive tech found on the 2016 Chevy Malibu, and why we think his tried-and-true model line offers some of the best entertainment, safety, and connectivity tech available today. Come with us as we look closer at the new Malibu – just don’t be surprised if you find yourself wanting one pretty badly in the near future. When it comes to providing top-of-the-line entertainment with all the comforts of your own hoe living room, few systems beat the Chevy MyLink, now available on the 2016 Chevy Malibu. With MyLink, passengers can seamlessly integrate a mobile device for streaming audio and MP3 playback just about anywhere on the road. Boasting available wireless and USB connectivity for all your favorite music, the Impala’s MyLink system can stream Pandora radio and SiriusXM Satellite Radio on a free three-month trial. Users can also count on the available Pioneer premium 9-speaker audio system to blast those tunes loud enough for just about everybody to hear – meaning more enjoyment for you, and less road noise to disrupt the fun. When it comes to providing total safety in the face of unpredictable other drivers on the road, few features beat preventative safety tech – and the Malibu provides just that with its impressive StabiliTrak Electronic Stability Control System with Traction Control, available Side Blind Zone Alert, and available Rear Cross Traffic Alert that make everything from merging on the highway to pulling in and out of tight parking spaces a breeze. And if the unthinkable were to occur, the Malibu is ready to protect with 10 standard airbags and available OnStar Automatic Crash Response technology that can pinpoint your location and send help immediately after an accident. With all this safety tech, you’ll drive with peace of mind on just about any road in your Malibu. For those sick of having to leave life behind as soon as you get behind the wheel, fret no more – the Malibu can keep you connected and in control on the road thanks to integrated 4G LTE Wi-Fi throughout the cabin. 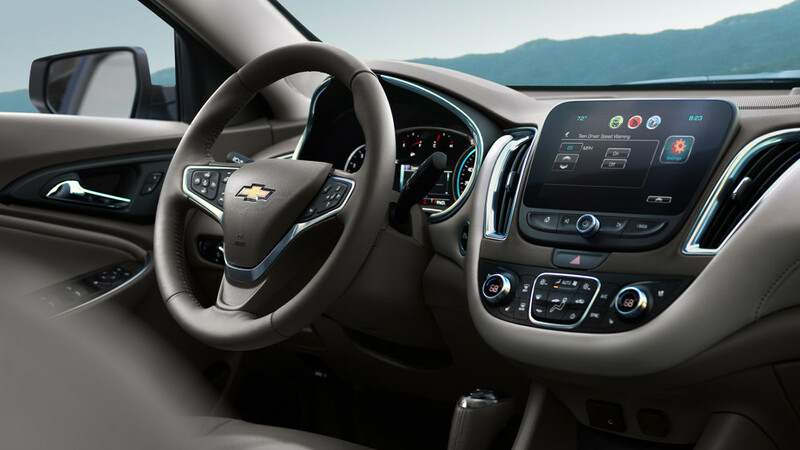 Plus, with access to Chevy’s RemoteLink smartphone app that can keep you connected to your vehicle no matter where you go – even acting as a remote key fob and available remote starter – you will always be near your Malibu, even if not physically. This is only some of the most impressive tech available on this year’s new Chevy Malibu. Whether you’ve been looking for a solid vehicle that won’t let you down or a tech-heavy ride to match your lifestyle, the Malibu might just be the perfect car for the job – so get out there and try one out, before the secret gets out.